Wink of Stella Markers contain premium, waterbased pigment glitter dust ink that's perfect for adding shimmer and shine over other marker colors when dry. 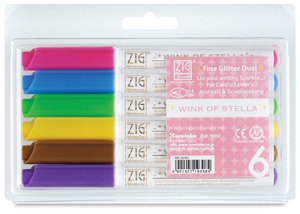 The 0.8 mm tip offers great control on papercrafts, stamping projects, and much more. Wink of Stella ink is photo-safe, acid-free, and lightfast. This set includes Glitter Dark Pink, Glitter Blue, Glitter Green, Glitter Yellow, Glitter Brown, and Glitter Violet.